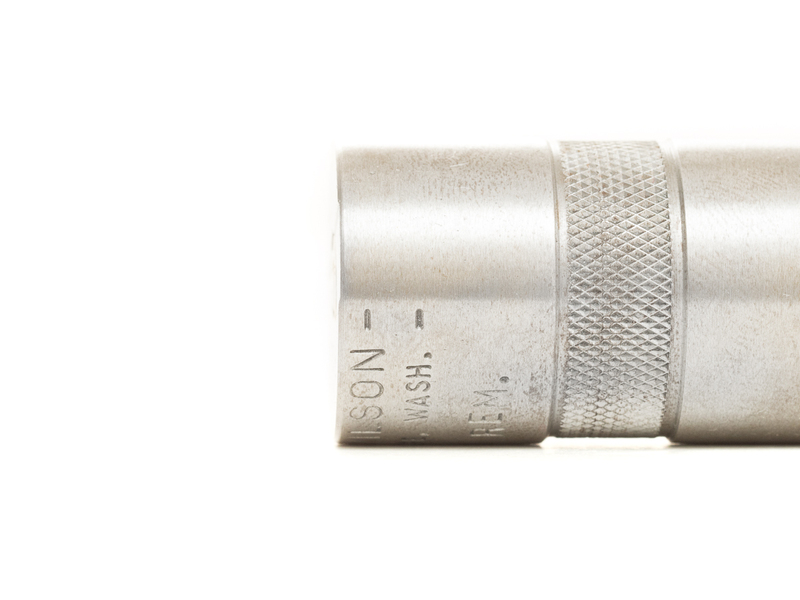 A case gauge is a very handy tool to have in order to diagnose and troubleshoot possible ammunition related issues with firearms. 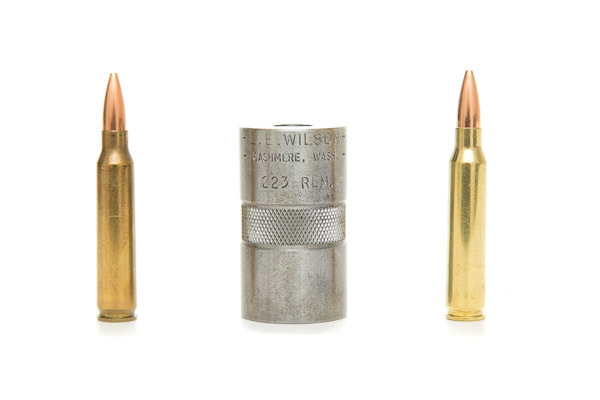 Case gauges are generally used by reloaders or handloaders (people who make their own ammunition) as a quick test for checking oversized or undersized brass. 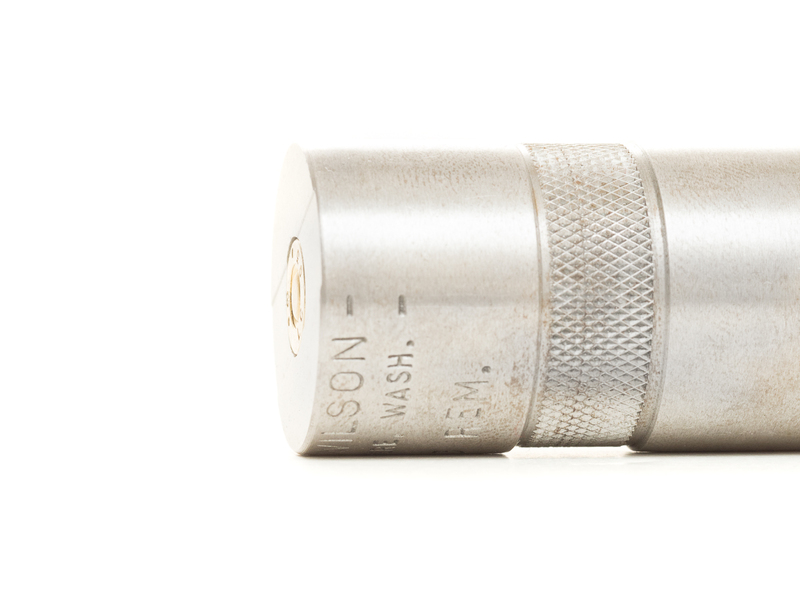 But the gauges are also extremely useful for checking the size of the case on loaded ammunition as well. A lot of times, I’ll come across people who say they had problems at the range chambering, feeding, extracting, ejecting, etc., ammunition in their guns. If it’s a new build, I’ll always ask if they headspace checked the rifle, and the answer is usually no. But I will also if they case checked the ammo, and the answer is almost always no, as well, and they often don’t understand how. Checking the case is a very simple task and only requires a fairly inexpensive gauge, such as the LE Wilson case gauge. 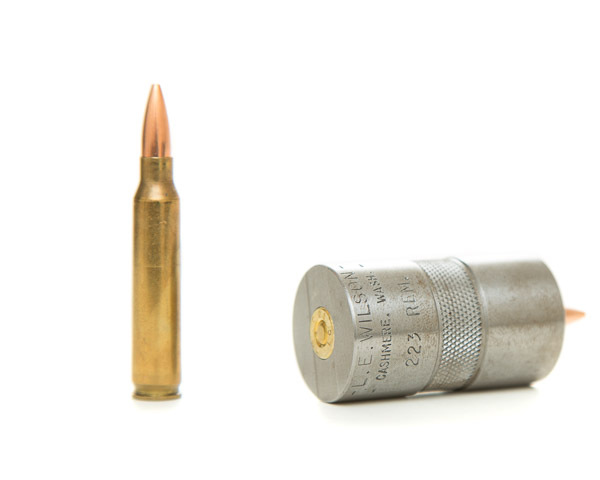 The case gauge can be used on loaded ammo by simply inserting the cartridge into the gauge and seeing if the head of case is flush with the back of the gauge. You’ll notice that the flat of the gauge has slight groove. This is supposed give you an idea of max and min headspace, and generally the case head should be between the top and lower portion of the groove. 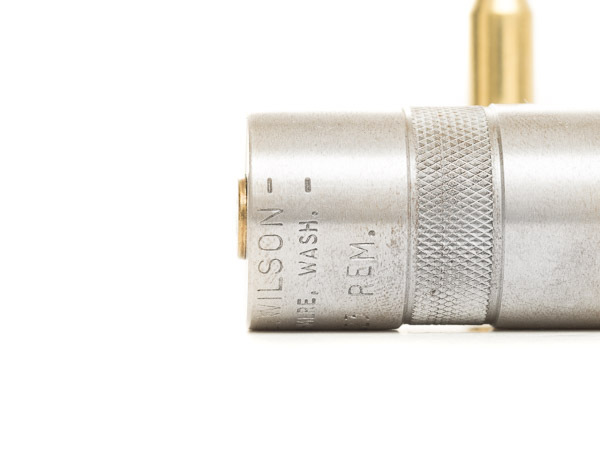 I personally don’t utilize this considering the groove is so small in depth (.005″ according to the LE Wilson instructions), that eyeballing that is not very precise. My main concern is to check to see if the case head itself cannot sit flush with the flat of the gauge. If the case head does not fit flush with flat of the gauge, then I know the ammunition (or the case itself, at least) is out of spec: undersized body or base, bad headspace / shoulder bump, etc. From this point, I know the cartridge itself should be rejected and not used because it will most likely result in the gun being out of battery if chambered. The above photos show an out of spec cartridge. This case is most likely undersized as far as the shoulder is concerned. Another common issue that would result in a case not fitting is an oversized base. This is usually something you’ll see with reloaded once-fired 5.56 NATO brass that was originally shot out of M249 or some other fully automatic weapons system. Brass that is shot out of an M249 or other light machine gun usually comes out quite expanded, particularly in the base area (body of case closest to the case head). This this because the chambers of light machine guns may have looser tolerance chambers to aid in feeding. 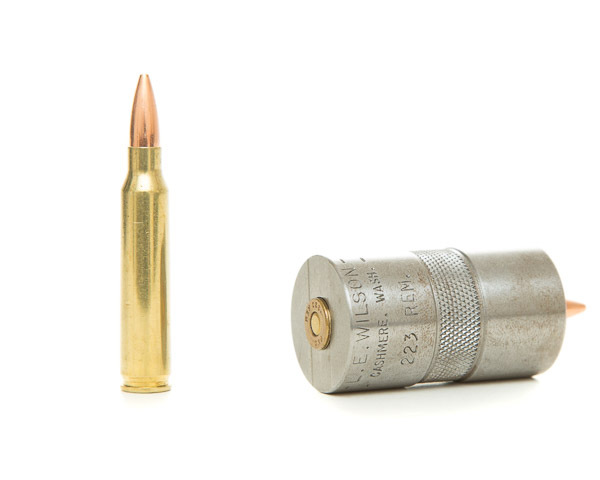 When reloaders resize the once-fired brass from an M249, a lot of times the setup of the resizing die is not sizing the base enough, resulting in a base that is too large in diameter to fit in a .223 Remington or 5.56 NATO chamber. Anyway, this is the basic gist of using a case gauge to check your ammo. Again, a case gauge is a fairly inexpensive tool at around $25 depending on the retailer, and you don’t have to be a reloader to make effective use of one, since it can be used to test factory ammo as well. Note that you do need to get a gage for each specific cartridge type you want to check, so in that regards it does get expensive. But considering the cost, I think a .223 Remington case gauge is a must have for any AR-15 owner, no matter what ammunition (factory or remanufactured / reloads / handloads) you use. Thanks for the post Ocab, great write-up. I get a lot of use out of my L.E. Wilson gauges. Might I ask what lens you use to take the closeups? Also, do you have any write-ups on precision bolt action rifles? Hassan: I’m actually using an Olympus 60mm f/2.8 Macro on an Olympus OM-D E-M10 Mark II (my first Micro 4/3rds camera). I actually don’t have a Macro lens for my Canon 5D Mark III. I did have the Canon 100mm f/2.8L a few years back, before I was messing around with Macro, and sold it. I really should buy another one, but I recently bought the Olympus MFT as a supplementary camera, and decided to get a Macro lens for it so I could mess around with it more. I’m actually liking MFT for general purpose use (great portability), but of course, the full frame sensor of the 5D3 is still hard to beat. I don’t shoot precision bolt rifles much right now. I used to 10+ years ago (which is what got me reloading/handloading for accuracy). I have a Savage 10FP in .308 in a McMillan A-5 stock and a custom Eliseo R5 tube gun (Remington 700 action) in 6mm BR. But I’m thinking my next project is going to be a bolt rifle. I was thinking about tearing down my Savage, rebarreling for 6.5 Creedmoor. But I kind of want a detachable box magazine, and unfortunately, there really isn’t an option for my Savage 10FP. The AICS chassis for the Savage action is only for the current generation Savage actions from ~2007 on to present day. My Savage is from 2003. So, I might build from scratch with a bare Remington 700 action or a bare custom 700 (e.g. Surgeon Precision). But bolt gun projects can get pricey quick, so even if I start it, it’s going to be a long journey. It might have been Chase Jarvis that said, “The best camera is the one that’s with you.” so it makes sense to make sure it’s a good one! I have a Canon 6D that I use for landscape photography (primarily night photography) and am looking for a good macro lens to take while backpacking. I currently have a Remington 700 SPS AAC-SD in .308 with a 16.5″ barrel 1/10 twist. 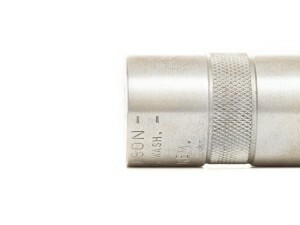 Everything on the action, with the exception of an enlarged bolt knob is factory. I have it in a McMillan A-5 stock, and a Badger M-5 magazine well. I would like to send it off to a gunsmith for some work. As you mentioned, the precision rifle projects are much more drawn out and pricy. It’s been a little discouraging to continue putting money into the Remington 700, since I can pattern tighter groups with my 16″ AR-15 build. I agree. I see very very home builders know what headspace is or posed a set of gages let alone know how to use them. It is frightening how many people will build up an AR and and just assume the barrel and bolt are properly head spaced. It is also amazing how many people don’t factor in the inconsistency of factory ammo when experiencing FTF or FTE issues. It seems like a lot of home builders are convinced they are over/under gassed when in fact it’s cheap steal cased or com block ammo that’s causing their problems. A set of go/no and field gages as well as a caliber specific case gage is cheap insurance to keep your firearm on the firing line and off your bench.